UnPrintable Series - Printing Tips from Paper Presentation! We require a minimum resolution of 300 DPI, and have many times required files in 600 or higher resolutions. 2) If you are using special fonts or foreign language-fonts, it must be embedded such as PDf files, or Outlined (AI) or provided to us separately with your order. Please note that Outlined fonts are not editable. Thus, files with “missing fonts” as mentioned above are UnPrintable. 3) Files generated with MS Word, Excel, Power Point or WordPerfect are not suitable for high-resolution printing. This is because fonts or the layouts will vary from one machine to another. The solution to this is to send us your file in a PDF format. 4) Files with missing image links, or the actual image files are UnPrintable. 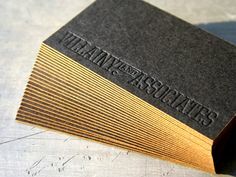 1) We have the capacity and technology to print on dark/ black paper or card stocks. However, running Digital or Full Color Offset or PMS color inks on dark material usually does not print very well, with the printed area appearing almost invisible. This problem is due to the fact that Digital and Full Color Offset or Raised inks are printed using CMYK colors. In CMYK printing, ink is somewhat transparent/translucent. So as a result, the color of the paper is combined with the ink color and results in a totally different color which may not be visible or legible. To print on dark or black stocks, the most suitable methods are Hot Foil Stamping or Engraving Printing. However, these methods also require a minimum quantity. 2) Paper or any material that is less than 17 lb, very flimsy or heavily textured will be very difficult to feed through printers, as it will cause a jam. 3) It is not possible print on paper with uneven or deep cuts on the sides. This may make it difficult to feed correctly through printers and may result in streaks or off-centered prints. 4) We cannot print on paper or stocks with special finishing surfaces with too much texture. These may not be suitable for digital printing, but are only usable in Foil Stamping or Offset Printing. 5) Printing PMS or Pantone color inks accurately on colored stocks, dark stocks or black stocks is not possible. 1) Letterpress with no ink or Blank impressions on Dark or Black material are possible, but not as easily legible. However, the result is a very subtle and unique. 2) CMYK inks on black stock do not produce well. 3) Digital printing, inkjet, laser or offset do not print well on dark or black card stocks. 4) It is not possible to perform Raised or Thermography on very thin stock due to the nature of high temperatures used in the production process. 5) White ink in not possible with Digital or Laser or Digital Offset printing, especially on dark stocks. The only method suitable for white ink is Hot Foil Stamping or Engraving. Many jobs are not cost or time effective to print via certain methods or printing services. For example, with Offset, Foil stamping, Letterpress and Raised Printing; there is a minimum of $200- $300 to make the plate or die for the first piece. So these methods are sensible for 50 to 250 pieces minimum of the same piece (not one of 50 different ones) to be cost effective. Also please keep in mind that depending on the complexity and volume of the job, we may require additional production time (between 7-10 business days).